Morning rush hour is in full swing in suburban Denver and there's an unusual number of cars parked in front of C.B & Pottsin Greenwood Village. The restaurant and brewery opened four hours early to accommodate patrons wanting to watch the U.S./Slovenia World Cup match. 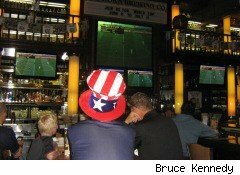 A week earlier, the cavernous establishment was packed with people watching the U.S. side play to a tie against England. General manager Steve Boothe says there were 200 to 300 additional customers in the restaurant, on top of the usual lunchtime crowd of 400 or so, for that game. For this match, about 40 people were in attendance soon after the local start time of 7:30 a.m. There were families with young children in full soccer gear as well as groups of friends starting their day with omelets, club sandwiches, Bloody Marys, mimosas and beers on special. "There are about 15 more TVs, a louder speaker system [than at home], " says Scott Sample of Littleton. "You can get a lot more rowdy here." And Boothe says the special World Cup event makes good business sense for his restaurant. "[There's] definitely more interest than years past," he says, "and it's a world sport, so we want to be the place...where you can come to watch the soccer." There's more than just anecdotal evidence that the World Cup has caught on with Americans. ESPN and ABC are reportedly averaging nearly five million viewers per round. That's more than double the number of viewers who watched the first five games of the 2006 World Cup. The Nielsen Company, meanwhile, estimates that 14.5 million U.S. viewers watched the England/U.S. game on ABC and Univision -- including the pre-game telecasts -- making it the highest-rated U.S. men's national soccer team game since 1994. New information technologies also appear to be playing an important role in the ratings boost. ESPN reports that during the World Cup's first three days, 65% of the audience accessed the matches via television only, while 24% of consumers combined TV-watching with other media platforms and 11% got their World Cup fix solely from a non-TV platform. A notable example was online community discussion of the error by English goalkeeper Robert Green during the U.S. game. A Nielsen analysis of English-language, World-Cup related messages on blogs, social networking groups, message boards, videos and image sites found that Green was the subject of nearly 11.5% of all related messages for the next several days -- making him the most discussed person on either team. Soccer Fever Hits Critical Mass in U.S.
"Thanks to social media and enhanced access to games and news from around the world, soccer fever has hit a critical mass in the United States," said Stephen Master, Nielsen's vice president of sports. He also called the high ratings a validation of "soccer's momentum across America." An important factor in improved ratings for the World Cup appears to be a growing acceptance of soccer in the U.S. Americans who grew up watching and playing soccer are now consuming it as part of the global World Cup audience. A Nielsen breakdown of the U.S./England match's audience revealed that 57% of U.S. viewers were in the 18 to 49 year-old demographic, with teenagers making up nearly 7% of the total audience. "We've played soccer our whole lives," says 23-year-old Michelle Sexton, who was watching the U.S./Slovenia match at C.B.& Potts with some family members. "I wish it was a bigger deal here, as it is everywhere in the world." Another patron, Bill Knapp, says U.S. soccer "has a long road ahead of it, but it's definitely increasing in popularity each year. You can see that in the youth leagues starting up, the term 'soccer mom' and the minivans with bags of balls in the back." "Soccer for young people, for the last 15 years or so, has grown immensely," says Dr. Gordon Van Stroh, professor of management at Denver University's Daniels College of Business. "So I think that a lot of those kids that participated in those programs, they're coming of age. Those kids now are identifying with the experience that they had, as youngsters, in terms of soccer." Dr. Van Stroh believes the World Cup is also attracting a larger audience, beyond soccer enthusiasts and fans: people who, as with the Olympic Games, enjoy a global sporting event -- as well as viewers looking for some much-needed distraction. "We live in a world that's got a lot of distressed issues right now," he says, "and sports is one thing....in our lives that is more common to us. Sure the competition may be strong, but the intent is that it's a friendly competition. It's intended to be positive."